This season is coming to a beautiful end next week having already a big variety of big guests during this period (2016-2017) and hosting exclusive interviews/mixes from acts like Luna-C, Liquid, Si from 2 Bad Mice, RatPack, Billy Daniel Bunter, Fat Controller, DJ Vibes, TNO Project, FFF, DieTRAX, ComeRaveInPeace, Demcore, Systec & SiR Rice. Thus, I'm very pleased to announce my upcoming "FULL ON MASK HYSTERIA 25th Anniversary Special" including also an exclusive interview with the legendary Mark Archer. And this one will be presented on the last showcase of Generation X [RadioShow]. 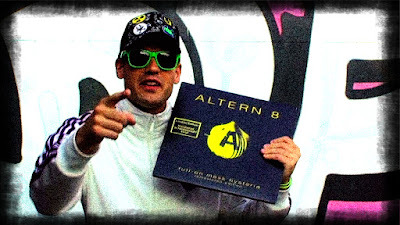 "FULL ON MASK HYSTERIA" is an album which I personally describe as rave bible, the beginning, the groundbreaking Altern-8 duet and the big legacy. Will be playing out all tunes from the remastered version which was released in last year's second half. And here's the promo video for this closing episode made alongside the essential help of my friends. BIG Thanx to Marina for shooting the video Akrivi for editing and Tony L for the artwork and his continuous big support!! Top one, nice one amigos!! ...Watch Ya Bassbins I'm Telling ya!